What changes will make the 2018 Nissan Murano different? Tweaked styling and an engine upgrade. They’ll highlight the midcycle refresh of a midsize crossover that still looks avant garde three model years after its 2015 redesign. Murano will remain a five-seater positioned in Nissan’s SUV lineup above the compact Rogue and as a racier companion to the slightly larger, seven-passenger Pathfinder. Likely also to include improvements in handling and features, the model-year ’18 updates should sustain this fashion-conscious crossover to its next complete redesign, likely for model-year 2020 or ’21. Because it ought to correct Murano’s biggest deficit – an outdated engine – and at least address one of its lesser faults, laborious handling. We’d urge Nissan to also liberalize availability of top-tier safety systems — notably autonomous emergency braking — beyond the most expensive Murano trim levels. As for styling, expect only detail changes to the striking exterior design and contemporary cabin décor introduced with the 2015 redesign. An additional model grade, perhaps an overtly sporty version, is a possibility. Expect all ‘18 Muranos to get a new, more modern V-6 with more power and a needed measure of smoothness. Recalibration of the transmission, steering, and suspension should further improve drivability and road manners. Fuel economy should remain near the top of the competitive set. If you like the current draft of its extroverted styling and find the dated engine refined enough. You’ll also save a few bucks on end-of-year clearance sales as dealers drain inventories in preparation for the freshened 2018 model. 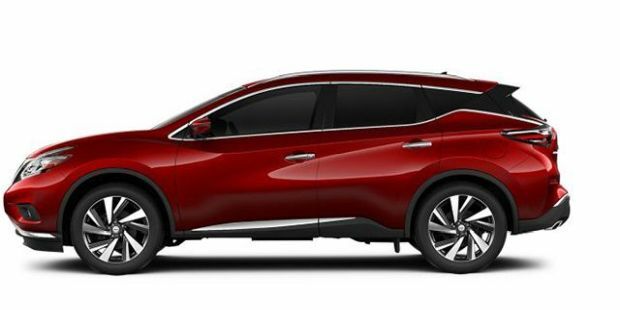 The ’17 Murano is unchanged from its 2015 redesign, when it shed its drab teardrop shape for a mix of tensioned curves and taut angles. That set it visually apart from direct rivals such as the Ford Edge and Jeep Grand Cherokee. The look isn’t for everyone; Murano sales rank in the bottom half of the crowded midsize-crossover segment. But it seems to be catching on; sales of the 2016 model up more than 40 percent. Barring intro of a dedicated sport model, the ’17’s core lineup likely to be carried over for 2018: base S, better-equipped SV, luxury-oriented SL, and flagship Platinum. All would return with a choice of front-wheel drive or all-wheel drive (AWD). Yes, but not enough to water down the demonstrative presence. The ’15 Murano was among the first Nissans to adopt the brand’s signature “V-Motion” grille design, which will return minimally altered. Same for the blacked-out sections of rear roof pillar and the main body shape, including back-fender kick-ups that look a little like tailfins. Revised fasciae front and rear and additional color choices should round out the exterior freshening. The wheels – 20-inch alloys for the Platinum, 18-inch alloys for the other models – are likely to have a new look, too. S and SV models should return with cloth upholstery, though it’s likely to be of a richer material. On all models the dashboard design will remain less severe than the exterior, but no less modern. Controls should again be logically arrayed and clearly labeled. Every model will retain a 7-inch display between the speedometer and tachometer; it’s packed with easily accessed audio, phone, trip, and vehicle-systems data. Navigation-equipped Muranos will again have an 8-inch central-dashboard screen serving a system with intuitive icons and better-than-average voice recognition. Nissan won’t tamper with the size of a roomy cabin that should again features seats with a nice blend of suppleness and support; there’s even width enough for an adult on the center of the rear bench. Cargo volume will remain tighter than in leading five-passenger rivals but be adequate. Yes, for the better. The sole engine will remain a 3.5-liter V-6 but instead of an over-decade-old design it’ll be Nissan’s newest, with such up-to-date tech as direct fuel injection. Judging from the same V-6 transplant given the 2017 Pathfinder, look for a boost in horsepower, to 284 from 260, and an increase in torque, to 259 pound-feet from 240. Acceleration, which had been satisfactory, should improve. More important, the new engine should run with less mechanical coarseness. It’ll again mate with a continuously variable transmission. A CVT performs the duties of a conventional automatic transmission, but without stepped gear ratios. Nissan CVTs mimic traditional automatics better than most, but a recalibration for ’18 should contribute to smarter throttle response. We’ll hope for quicker-reacting steering and better control of body lean and pitch on curving and wavy roads. But we anticipate that road manners will continue to favor ride comfort over sporty handling and that the 20-inch wheels won’t absorb impacts as well as the 18s. 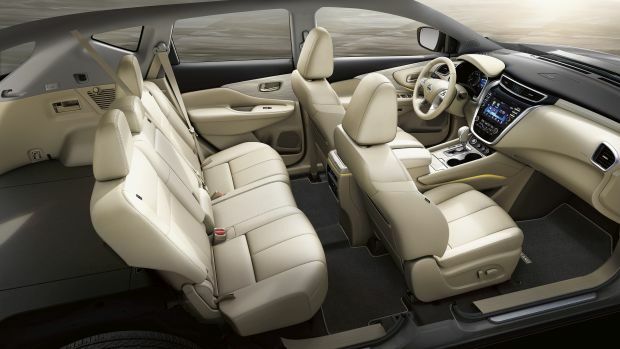 With a modest 6.9 inches of ground clearance, Murano’s not intended as an off-roader. The AWD system, which normally operates in front-wheel drive and shuffles power fore and aft to quell tire slip, is designed primarily as a traction enhancer in snow or on gravely surfaces. Probably not – but it isn’t likely to drop, either. That’s laudable, given the expected increase in horsepower and torque. That assessment is based on unchanged EPA ratings following a similar engine transplant for the 2017 Pathfinder. EPA ratings identical or little-changed for the Murano would keep it near the top of its competitive set, one apparent testament to the efficiency of the CVT. Expect 2018 ratings of 21/28/24 mpg city/highway/combined with front-wheel drive and 21/28/24 mpg with AWD. Perhaps a motion-activated power liftgate, but a major influx of new features isn’t likely; Murano already offers most every amenity expected of a modern midsize crossover. More probable is that Nissan could shuffle a few features among trim levels. Or it could add a model grade that would create a new feature set: a sport edition with extra-bolstered front bucket seats, for example. Most important, we’d ask the automaker to expand availability of forward collision warning with autonomous emergency braking beyond the SL and Platinum models, where it’s been an exclusive option in conjunction with adaptive cruise control. With the ability to automatically stop the vehicle to mitigate a frontal collision, autonomous emergency braking is a prerequisite to today’s most desired safety rating, Top Safety Pick+ status from the Insurance Institute for Highway safety. The SV model has been optionally available with blind-spot and rear cross-traffic detection, which has been standard on SL and Platinum. 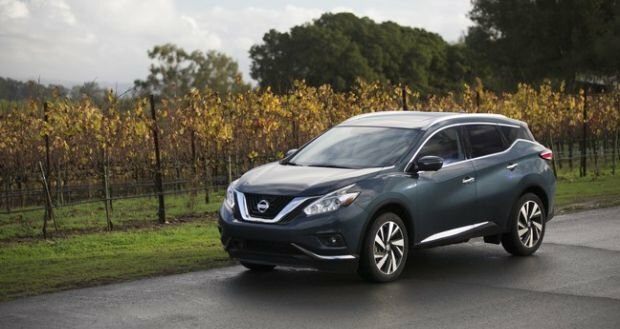 Further enhancing driver aids, Nissan ought to make the ’18 Murano available with lane-wander alert and automatic steering correction, a feature available on many rivals. Otherwise, a fine array of features should repeat as standard on every trim, including keyless entry and pushbutton ignition, a rearview camera, Bluetooth linking, and LED daytime running lights. Same for the automaker’s clever Easy Fill Tire Alert, which beeps the horn when you’ve reached proper inflation. All but the S should return with fog lamps and power-adjustable front seats. And unlike some competitors that reserve an integrated navigation system for their upper grades, every Murano should again be available with Nissan’s fine GPS system; it’ll again be optional on the S and standard on the others. Expect no change in availability of some features: a power front passenger seat should remain standard on all but the S model, for instance, while options like the panoramic moonroof will continue as an option on all but the S. A power liftgate will probably remain an exclusive standard feature for SL and Platinum and could gain activation via a foot waggle beneath the rear bumper. The Platinum is likely to retain exclusive rights to such features as front-seat cooling and rear-seat heating, power-return folding rear seatbacks, and LED low- and high-beam headlamps. With front-wheel drive, look for the 2018 Murano S to start around $31,000, the SV around $34,100, the SL around $38,500, and the Platinum around $40,600. Most Murano buyers are expected to again specify AWD, which adds around $1,600 to the base price. Key options could be shuffled for 2018, but expect navigation to remain part of an $860 S package and again include a USB interface for iPod and other compatible devices. If Nissan doesn’t alter availability of adaptive cruise control and front-collision warning with autonomous braking, those features would again be part of the SL and Platinum Technology Package, a $2,260 option that also includes the panoramic moonroof. Expect a fall 2017 release date for the 2018 Murano. Even with a facelift, don’t expect the styling to be any less polarizing. Given that, we’re pleased Nissan’s moving to update Murano’s engine and hope it will also upgrade steering and handling and most vitally, widen availability of key safety features.